On Sunday, the John Hackworth era hit the ten game mark. Despite starting the first game under Hackworth with a tough 1–0 loss at home to DC United, the Philadelphia Union rebounded with a massive 4–0 win over Kansas City before sputtering to a 2–1 loss on the road against Houston. The team rebounded with three straight wins, beginning with the improbable victory over LA on July 4th, along the way laying down the longest home win streak, in fact the longest win streak of any kind, in the club’s young history. Two losses on the road to New York and Montreal sandwiched another home win, this time against New England, before a thoroughly disappointing performance against Chicago saw the home streak end at four games. With the loss to Chicago, the Philadelphia Union’s record under Hackworth now stands at .500. 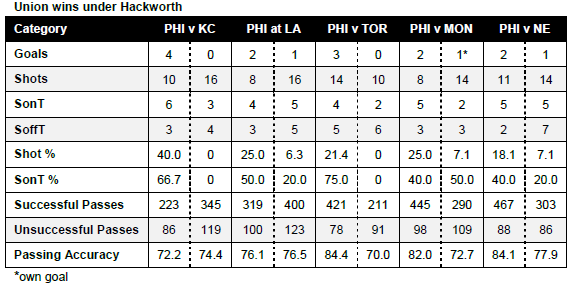 Looking at the match stats from the wins and losses under Hackworth, some obvious numbers stand out. In each of the wins, the Union scored at least 2 goals while holding their opponent to no more than 1 goal, including 2 shutouts. In the losses, the Union were shutout 3 times and never scored more than 1 goal in the other 2 defeats. In every loss but 1, the Union has allowed at least 2 goals. Looking back over the entire season so far, Philadelphia has not managed a win or a draw against an opponent that has scored 2 goals against them. The Union’s poor road form is also readily apparent, with 3 of the losses and only 1 win coming away from PPL Park. The Union have been out-shot in 3 of the losses but they’ve also been out-shot in 4 of the wins. Perhaps more importantly, Philadelphia has had fewer shots on goal than their opponent in 3 of the losses, 3 times managing only 2 shots on goal. In the wins under Hackworth, the Union have had more shots on goal than their opponent 3 times and the same number of shots on goal once. While in only 1 loss have they recorded 4 shots on target, they recorded a minimum of 4 shots on target in each of the wins. Though the team has scored 13 goals while allowing only 3 in wins under Hackworth, it has scored only 2 goals while allowing 10 in losses, a massive swing in goal difference from +10 to -8. The home scoring record under Hackworth is 12 goals for and 6 against. On the road it is 3 goals for and 7 against. Overall, the Union have scored 15 goals in the 10 games under Hackworth compared to 8 goals in the 11 games under Peter Nowak. But the 13 goals allowed under Hackworth is only 1 goal less than the 14 allowed under Nowak. In terms of goal difference, that’s +2 under Hackworth and -6 under Nowak. Home or away, the offensive trend has not been good for the Union over the last 5 games, particularly in view of the team’s fading playoff hopes. In the first 5 games under Hackworth, the team went 3–2–0, outscoring opponents 10 goals to 4 along the way. Over the last 5 games, the team has gone 2–3–0, being outscored by opponents 5 goals to 9. Where once they were hot, now they are not. 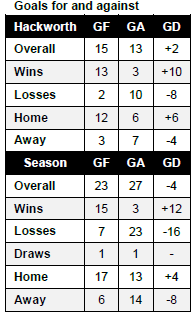 Looking at the season as a whole, the Union have a negative goal difference of -4 from 23 goals for and 27 against. Only 3 teams—Portland, Columbus, and Chivas USA—have scored fewer goals than the Union so far in 2012. Of those three, Columbus has played one fewer game (20), while Chivas has played the same number (21) as the Union and Portland has played 1 more. Across the league for 2012, 12 teams have allowed more goals than the Union. 6 teams have a poorer goal difference than the Union’s -4, the worst being Chivas at -11, Toronto at -15, and Portland at -17. Turning to goal difference for home games, 5 teams have a worse goal difference than the Union, Chivas USA’s -9 being worst in the league. For goal difference on the road, six teams, including New York and DC, share the Union’s -8. 4 teams have a poorer road goal difference: FC Dallas at -9, Colorado at -12, Montreal at -15, and Portland at -18. The Union are currently 17th on the league table with 13 games left to play. Every game but 1 is against Eastern Conference rivals and 7 of those games are on the road. While they will rightly continue to fight for a chance to make the playoffs—hopefully with more spirit and smarts than they showed on Sunday night—it is pretty apparent that the playoffs are becoming a very remote possibility. Should it come to pass that the playoffs are undeniably out of reach, what will the Union have to play for? Taking the long view, the remaining games will be about giving young players the experience they will need to build a more successful campaign in 2013. Every player will be fighting to show they deserve a place on the team next season. But there is a more abstract goal to play for, and that is finishing out of the bottom 3 spots on the league table. Although relegation isn’t a possibility, everyone—the fans, the players, the coaching staff—knows it is the reality that the bottom 3 teams would face in just about every other league in the world. It might only be symbolic, but finishing out of the bottom 3 would be a meaningful victory after a tough season for this Union fan. On the other hand, we’ve come a long way since those days were we were lucky to have 5 total shots the whole game. Even .500 under Hackworth (5 wins, 5 losses, 15 points) is better than .500 frequently was under Nowak (more likely to be something like 2 wins, 2 loses, 6 ties, 12 points). I really hope you’re wrong about that. A few more lineup tweaks up front with a solidified back line featuring Valdes, Soumare, Williams and Garfan) and we might be okay. McMath is my biggest concern right now. He’s looking a little shaky. Looking ahead to the rest of the season, it is clear to me that the U need to score more goals than their opponents. A legit finisher is still on my wish list for the Union. Maybe this offseason? I love that we’ve rolled the dice on a bunch of guys but so far none of them has been the burgeoning star that Piotr/Diego/Sack/Hack anticipated. If at first you don’t succeed try, try again…..
Really? Frankly, JackinMac and Hip-hop-hoppenot seem like fairly capable finishers when the opportunity has presented. Like Hack said earlier on, we’ve been getting goals by committee, rather than having it fall on a Le Toux like savior (though I wouldn’t mind having him back). The key has been getting those opportunities. I’m more concerned about getting our sputtering midfield working. For me, that means getting Marfan in the game, Adu out of it, and bringing in some true wingers. Danny Cruz seems like a solid play in that direction.